This spring, Craft Brew Alliance will launch Omission Beer, the first craft beer brand in the United States focused exclusively on brewing great-tasting craft beers with traditional beer ingredients, including malted barley, that are specially crafted to be gluten-free. Omission beers are brewed by Widmer Brothers Brewing in Portland, Ore., which uses a proprietary brewing process to reduce the gluten levels to well below the widely accepted international gluten-free standard of 20 parts per million (ppm) for food and beverages. (The international gluten-free standard was set forth by the Codex Alimentarius Commission, which was created in 1963 by the Food and Agriculture Organization of the United Nations and the World Health Organization.) Omission Beer is expected to release the first beers in its portfolio, which will be available only in Oregon, on April 2. 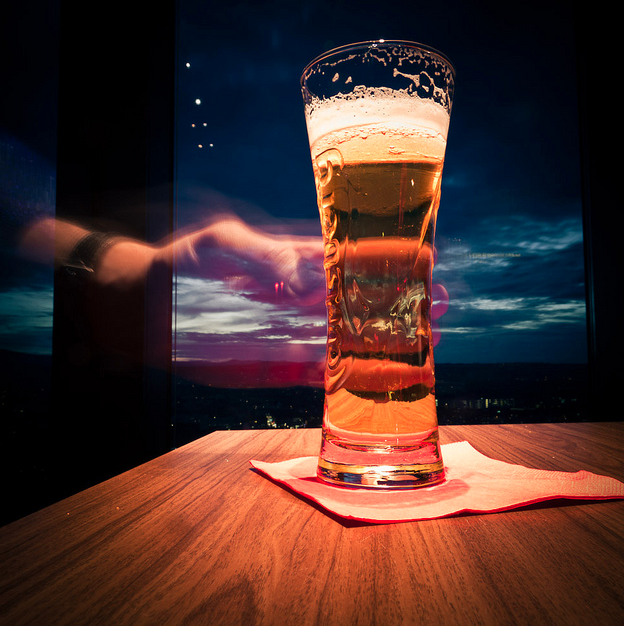 GlutenFreePDX has been invited to the exclusive unveiling event, and we are excited to try the new beer and report back! Whoo! This entry was posted in Beer, Beverages, Culture, Health, Ingredients, Labeling, News, Reviews and tagged Craft Brew Alliance, gluten free beer, new gluten free beer, Omission, Omission beer, Widmer, widmer brothers brewing, Widmer Gluten Free on March 26, 2012 by glutenfreepdx. Men’s Health has a pretty good list of gluten-free products that will add to your waistline, some of them in a big way! Imagine that an old high school friend of yours recently started sporting crazy neon wigs, push-up bras, and 8-inch heels to work—and within a year, she’d become a millionaire. Maybe you should try doing the same, right? Okay, but what if the friend in question was Nicki Minaj, while you were, well, a hardworking . . . accountant, paralegal, bus driver, or what have you. Chances are, the neon wigs and extra wiggle wouldn’t exactly help in your place of business, right? Something just like that is happening right now in the world of nutrition: the gluten-free craze. People who have a sensitivity to gluten—a protein found in cereal grains, especially wheat—have special needs (just like Nicki does), and eating gluten-free has a lot of benefits. But trying to copy that method when you’re not, in fact, gluten-sensitive can have plenty of downsides. Now, cutting down on gluten means cutting down on carbs, and that’s generally a good thing. The fewer muffins, bagels, and breadsticks you’re scarfing up, the healthier and leaner you’re going to be—as long as you’re replacing those carbs with nutritious foods like vegetables and lean meats. But as the number of gluten-free dieters has grown beyond those who simply can’t digest gluten, we’ve also seen a spike in the number of foods marketed as “gluten free.” Some of these foods are okay, but many others are simply new versions of the same old problems—essentially carb-loaded junk foods. They’re the equivalent of wearing a pink beehive into a law office; can’t help, probably hurts, maybe a lot. So while the jury is still out on the effectiveness of gluten-free diets, one thing is certain: The six foods on this list aren’t going to do you—or your belly—any favors. Banish them from your diet now and you’ll have less nutritional closet-cleaning to do later. If you’re looking to indulge without too much remorse, gingersnaps are often the way to go. Ginger naturally packs a flavorful punch without tacking on the caloric heft of chocolate chips, nuts, or candy pieces. Unfortunately, just two of Glow’s cookies contain as much saturated fat as 10 McDonald’s Chicken McNuggets and more calories than seven Nabisco Ginger Snaps! Enjoy Life uses fruit juices, dates, and applesauce to help sweeten and soften its cookies while keeping fat and calories to a minimum. Aleia relies on a combination of eggs and canola oil to bind its loaves, which means more fat and calories per slice. Build a sandwich on this bread, and you’ll be on your way to a belt-busting lunch before you’ve even added toppings. Instead, Udi’s bread cuts calories by a full third, and it’s bolstered by a substantial 6 grams of fiber and 5 grams of protein. Bagels are notoriously calorie-dense—even those without gluten. The listed serving size may be half a bagel, but don’t be fooled—few people will stop at half. To add further insult, Glutino’s also manages to pack in more fat per bagel than three scoops of Breyer’s Original Strawberry ice cream. Kinnikinnick’s is the most moderate bagel around. Make this your morning go-to instead, and you’ll save 12 pounds over six months! This “Totally Healthy” cake contains as many calories as 8.5 Fudgesicles, as much fat as 3.5 McDonald’s Hamburgers, and more sugar than 10 feet of Fruit by the Foot candy. Splurge on one of these cakes just twice a week and you’ll pack on 15 extra pounds by the end of the year! Satisfy your sweet tooth with Amy’s deceptively decadent loaf cake; because it comes frozen, you can defrost it a single slice at a time and save the rest for later. With 20 grams each of both fat and sugar, Udi’s granola resembles a dessert far more than it does a breakfast food. In fact, more honey and canola oil go into this granola than do fruit or nuts. Bakery on Main’s granola is still too calorie-dense to scarf down like cereal, but a judicious sprinkling over yogurt makes for a solid snack. Amy’s removes the gluten and the dairy from this dish, but leaves plenty of oil-derived fats. This diminutive tray packs as much fat as 9 Chewy Chips Ahoy cookies and fulfills 25 percent of your day’s saturated fat allowance. But in a rare, impressive feat, Glutino manages to create a decent Alfredo pasta. The key? A cream-free, milk-based cheese sauce and enough lean chicken to supply 15 grams of protein. This entry was posted in Baking, Cooking, Culture, Health, Ingredients, Reviews and tagged breakfast, calories, cereal grains, food, gluten free calories, Gluten free diets, gluten free foods that make you fat, Men's Health, nutrition on March 26, 2012 by glutenfreepdx. Chances are you know someone who avoids eating gluten, the stored protein found in wheat, rye, barley and several other common flours. These are the people who spend more than $2.6 billion a year on gluten-free food at the supermarket. The ones who pass on cake and cookies at the office, think twice about pastry and pizza and bring their own food when you invite them over for dinner. They have their reasons. Some believe they are gluten sensitive and say they feel better, physically and emotionally, when they don’t eat it. Others, those with celiac disease, cannot consume even a tiny amount of gluten without pain or damage to their small intestines. “Many physicians would roll their eyes and say, ‘God, another crazy person with food sensitivities,'” he says, but evidence is mounting that gluten sensitivity exists apart from celiac disease. He and other experts recommend first ruling out celiac disease and other forms of intestinal inflammation and then trying a gluten-free diet. Critics argue that people who jump on the gluten-free bandwagon without first consulting a doctor may be avoiding gluten unnecessarily, paying more for gluten-free food and wasting time and energy on monitoring their gluten intake. On the other hand, an estimated 3 million Americans, about 1 percent of the population, do have celiac disease, an autoimmune disorder that leaves them more vulnerable to a variety of complications, including cancer. That’s more than the number of people with epilepsy (2.7 million) or Parkinson’s disease (1 million), according to the University of Chicago Celiac Disease Center. Gluten Free Living, $34 a year. Living Without, $23 a year. “Celiac Disease: A Hidden Epidemic,” revised and updated, by Peter H.R. Green and Rory Jones, (William Morrow, 333 pages, $25.99). “Gluten-Free Diet: A Comprehensive Resource Guide,” expanded and revised, by Shelley Case (Case Nutrition Consulting Inc., 368 pages, $26.95). Americanceliac.org, the American Celiac Disease Alliance, tracks U.S. Food and Drug Administration guidelines on gluten-free food. Glutenfree-registry.com, a state-by-state guide to gluten-free restaurants, bakeries, caterers and grocers. GlutenFreePDX, the first Portland-centric dining guide for those seeking gluten-free restaurants and shops. Metro Portland Gluten Intolerance Group, meets 10 a.m. to noon on the second Saturday of each month at Legacy Emanuel Medical Center, 501 N. Graham St. No cost to attend meetings. Website lists gluten-free restaurants in the Portland area and includes a running blog, graindamaged.blog-spot.com. See gigbranches.org for branches in other cities and states. 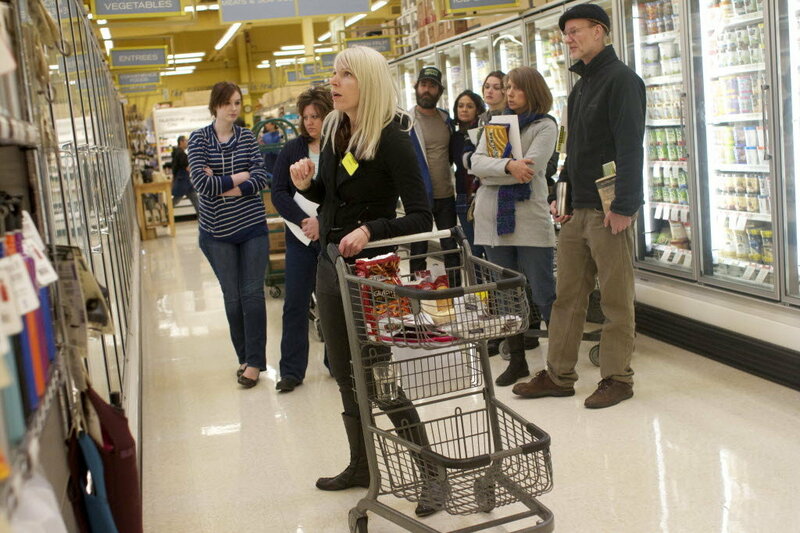 New Seasons markets offer free gluten-free tours and product tastings. Check the schedule at newseasonsmarket. Lingonberries Market, 6300 N.E. 117th Ave., Vancouver, specializes in gluten- and wheat-free products and allergy-friendly foods. More than 300 medical complaints have been associated with celiac disease. One physicians’ manual, “Recognizing Celiac Disease: Signs, Symptoms, Associated Disorders & Complications,” includes a 164-page chart. Experts say doctors often misdiagnose celiac, which means it can take years for patients to find out they have it. Then begins the painstaking process of eliminating gluten from their diets. “When you get a celiac diagnosis, the next thing you do is get a stronger pair of glasses,” says David Ward, 65, of Salem. “You have to read all the fine print on every label.” Ward says he’s discovered gluten in places most people wouldn’t look for it: in a common over-the-counter pain reliever, in the adhesive on imported envelopes, in bulk bins of Halloween candy prominently labeled “gluten-free” but manufactured on equipment also used to process wheat. Ward suspects he’s had celiac disease for years without realizing it, figuring that his main symptoms — feeling tired, depressed or angry — were “normal.” Since his diagnosis in 2004, his wife, Nancy, 65, has reorganized their kitchen, creating a gluten-free zone and dedicating several drawers to a variety of alternative flours and baking mixes, all marked “GF” and dated. She bakes her own gluten-free bread, packs gluten-free pretzels on road trips and takes gluten-free dishes to church potlucks, though fears of cross-contamination mean the couple don’t go out much anymore. “I’d make him a dish of baked beans and put it on the table,” she says. “And by the time I got there, some croutons from the Caesar salad had fallen in the beans,” he adds, shaking his head. Despite their best efforts, Ward says the longest he’s managed to “stay clean” (avoid eating gluten) is about eight months. He says he knows within five or six hours that he’s been contaminated, and it can take five or six weeks to feel good again. “I’ve checked everything I put on my skin, and all my medications,” she says. Her kitchen is divided between her gluten-free area and “glutopia,” where her husband and grown children prepare their food. She says she’s meticulous about keeping her kitchen and cooking utensils clean, and she hasn’t let celiac disease keep her from baking. She’s adapted and perfected some recipes — the biscotti she baked at Christmas, for example — and experimented with new ones. “This is a good time and a good place” to live with celiac disease, she says. Portland offers an abundance of fresh, whole “real” food free of gluten. “I love food, I love preparing food,” Hatten says, but she thinks about celiac disease and its implications “all the time.” She doesn’t eat out in cafes and restaurants very often, and when she’s invited to friends’ homes she takes her own food. Dr. Lisa Shaver has heard that before. As manager of the Portland branch of the Gluten Intolerance Group, she’s part of a national network that supports patients with gluten disorders. The Portland group meets on the second Saturday of each month at Legacy Emanuel Medical Center in North Portland. “I guess I’m an optimist, a ‘the-glass-is-half-full’ kind of person,” says the naturopath and acupuncturist who has been gluten-free for four years. She sees a gluten disorder as an opportunity to eat better, to shun processed food and focus on healthier choices. And, she adds, a diagnosis of celiac disease often comes as a relief to patients. This entry was posted in Baking, Beverages, Cooking, Culture, Health, Ingredients, Website and tagged Gluten free diets, Gluten free Portland, GlutenFreePDX, New Seasons, OregonLive on March 18, 2012 by glutenfreepdx. DENVER, March 9, 2012 /PRNewswire via COMTEX/ — As the demand for gluten-free continues to grow, Udi’s Gluten Free Foods is expanding their product line beyond bread and bakery staples to reach consumers at more eating occasions. Today Udi’s announced the launch of five new products during Natural Products Expo West in Anaheim, Calif. Frozen Pizza – Ideal for lunch or dinner, Udi’s delectable frozen pizzas are available in Pepperoni, Margherita, and 3-Cheese flavors. The gluten-free trend shows no signs of slowing. To stay on top of consumer demand, Udi’s focuses on new product innovation by creating foods that have the taste and texture of conventional gluten-filled products. Udi’s also strives to make healthy and wholesome foods with significant nutritional value by using super foods like chia and flax seeds that offer more protein and fiber. New products have already started rolling out, Udi’s Frozen Pizza and Muffin Tops are now available in stores and the other products will hit shelves this July. Udi’s Gluten Free Foods are available at national grocery stores and retailers and can be purchased online at http://www.udisglutenfree.com . All of Udi’s baked goods are made in a 100 percent dedicated, certified gluten free bakery located in Denver, Colo., to eliminate and prevent the risk of cross-contamination. Denver-based Udi’s Healthy Foods includes Udi’s Natural Artisan Granola and Udi’s Gluten Free Foods line of gluten free baked goods. All of Udi’s products are created fresh in Colorado using only the highest-quality wholesome ingredients. For more information, please visit http://www.udisglutenfree.com or call 303-657-6366. Find us on Facebook at http://www.facebook.com/udisglutenfree and Twitter @udisglutenfree. Be Udiful! This entry was posted in Culture, Health, Ingredients and tagged muffin tops, new gluten free products, Udi's on March 18, 2012 by glutenfreepdx. I couldn’t help but laugh because the solution I was looking for happened so serendipitously. I went to bed the night before trying to figure out what I was going to do with my left over mashed potatoes and as I drifted off, I saw a flash of my grandmother making gnocchi, so I awoke the next morning early and put the mashed potatoes to the test. Like Leo said, they are my new favorite. I served mine with a simple brown butter emulsion with plenty of Parmesan and sage, but you can serve these with whatever sauce you like. For the colder months, I like to spoon a hearty ragu over them that I then gratine in the broiler with plenty of Gruyere. 1. Peel and cube your potatoes and then bring them to a boil in a 4 quart pot with the salt. Boil until fork tender. Drain the potatoes and then return them to the pot. 2. Add the butter and milk and mash until there are no longer any lumps. The potatoes should be very thick. Salt to taste. Refrigerate overnight in a glass bowl covered with cellophane. 3. The next day, in a 9 x 13 sheet pan, flatten the mashed potatoes with a fork, spreading them out evenly. Mash in the yolks and the pepper. 4. Whisk flours together in a separate bowl. In tablespoon increments, sprinkle the flour over the potatoes and work in with the fork. By the third addition, you should be kneading the dough by hand. Season the dough to taste with salt. 5. Dust the counter with more flour and knead the dough to smooth and is not sticking whatsoever. You will have left over flour, so reserve for another batch. 6. Divide the dough into fourths and then roll into ropes about a foot long (12”) and ½ inch wide. Cut each rope into equal sized segments and then roll each segment into a ball. Press each ball in the with your thumb. Repeat until all the gnocchi are formed. 7. Cook immediately or cover tightly and refrigerate for up to 1 day before using. Freeze in an airtight container for up to three weeks. 2. The moment you can no longer see any milk fats, begin swirling the pan over the flame to brown the butter. The moment you see brown flecks over the bottom of the pan, add the water and remove from the heat. 3. Blend with a wand mixer until emulsified. Pour over gnocchi and serve with Parmesan and fresh sage. 5. Bake for 25 minutes, or until just beginning to color. 6. Remove from the oven, transfer the pan to a wire rack, and let cool completely. 7. Lift the shortbread from the pan by holding onto the sides of the aluminum foil. Remove the aluminum foil and use a large, sharp knife to cut the shortbread into 3-inch squares. 1. In a medium bowl, whisk together the pomegranate juice and confectioner’s sugar. Add the corn syrup or honey and the lemon zest. Whisk till very smooth. 2. Transfer the thick glaze to a pastry bag fitted with a small plain tip. 3. Decorate each square by piping on the glaze in a crisscross pattern. Allow the glaze to set for about 10 minutes before serving. Store in an airtight container for up to 3 days. Makes 12 squares. This entry was posted in Recipes and tagged gluten free recipes on March 7, 2012 by glutenfreepdx. Svelte provides you with the lasting nutrition and sustained energy you need to navigate through your active and busy day. Each rich, creamy flavor is created with 16g of protein from fresh organic soymilk, along with complex carbs for sustained energy. 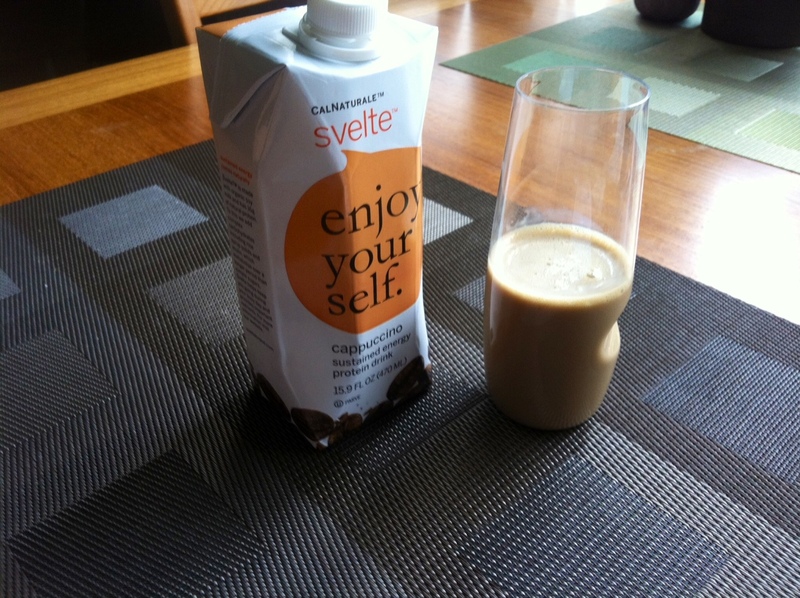 I was told to make sure to drink Svelte after it had been refrigerated, and I did as instructed. The four flavors offered are French Vanilla, Cappuccino, Chocolate and Spiced Chai. They are smooth and creamy, with a good amount of sweetness and flavor. The Stevia used to sweeten the drink has a slight bit of artificial taste, but flavors are well balanced. 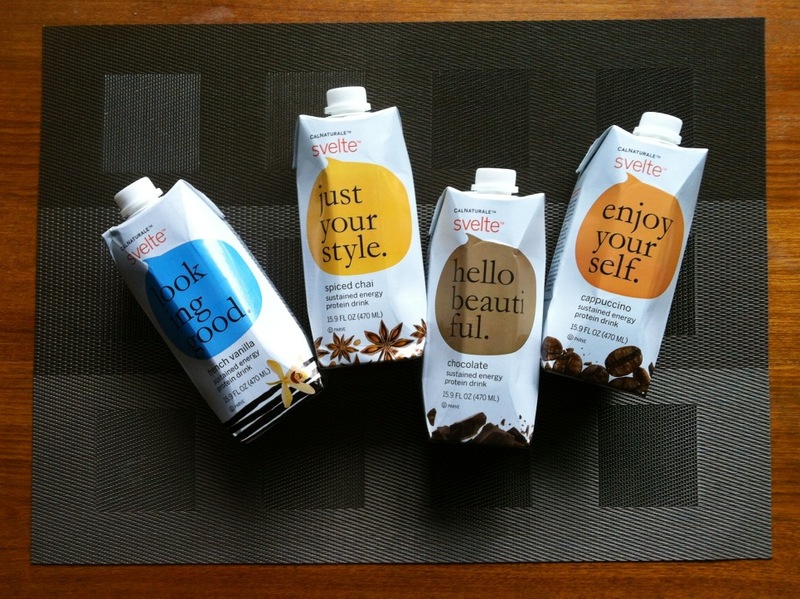 The TetraPak packaging is really nice, with good design and a pleasing label. My favorite flavor was the cappuccino, which had a great coffee flavor without being bitter or overly strong. With 20% of your daily fiber and 32% of your protein, Svelte seems like a smart choice for a light lunch or in between meals. Being certified gluten-free is great, and I’m sure many will be happy to find that Svelte is also dairy-free and lactose-free. Check out their website to learn more about Svelte, and look for it at places like Safeway, Whole Foods and even 24 Hour Fitness. And thanks to CalNaturale for giving GlutenFreePDX a chance to review! This entry was posted in Beverages, Culture, Health, Ingredients, Labeling, Reviews, Uncategorized, Website and tagged CalNaturale, energy drink, gluten free energy drink, organic soy, soy drink, Svelte, Svelte flavors on March 5, 2012 by glutenfreepdx.